So its that Season again. No, I'm not talking about Football season, I'm talking about Mini painting Season. Though you can totally combine them and paint minis while watching Football if you want. I know I do. But more specifically its painting season because Gamehole Con 2015 is coming up, and this year I'm running a Back the Future RPG with a lot of special guest cameos. And while I've playtested this game without minis and it went fine, I believe every game is always more fun with representative minis. 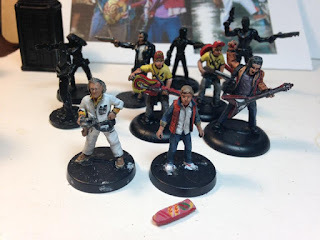 Especially when it means you get to paint up a Marty McFly. But there's still plenty more Chrono-warriors to go. So better get back to it. Jen Page is a Dungeon Master, Actor, Model, Artist and Writer who loves all things fantastic and weird. A life-long fan of Role-Playing Games, Jen is often recognized by die-rollers everywhere for her acting roles in Gamers: Dorkness Rising and Gamers: Hands of Fate. Jen's other recent acting projects include the dystopian Mecha-punk adventure Project London, as well as the Kung-Fu action comedy series Chop Socky Boom! Besides acting, Jen is also known for her captivating fantasy artwork and photography projects, which feature unique costume designs and awe-inspiring settings. Even with all this going on Jen still finds the time to run the occasional Call of Cthulhu game, and hang out at awesome conventions with her fellow gamers. 'Dark Heresy - Root out the Rot' at Gamehole Con! Friend of the Chainsword and High Priest of the Legendary Brandonomicon, Brando, will be running a Dark Heresy game at Gamehole Con this year. Dark Heresy is set in the gothic darkness of the grim Warhammer 40K universe, so if you're into demon-hunting space Inquisitors with plasma pistols and flying robot babies as sidekicks, then you definitely won't want to miss it! Well, he protects the important people. You? Not so much. It’s your job to prove your worth in His eyes, not for him to give you things. You’re on a mega-hive-city on the Imperial planet of Malfi, when you’ve been commanded volunteered by a dreaded Inquisitor to report for duty. Well, it was actually a lowly clerk who was acting on his behalf. Anyway, you’ve gotta do what you’re told. It’s important. It says so right on the label. That’s pretty much it. Somewhere in the hive there’s some heresy going on and you’re going to find it and destroy that which offends the Emperor. Oh, what’s that? 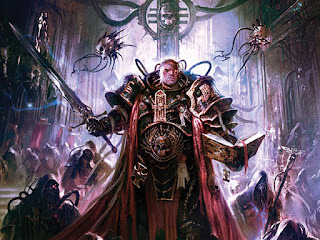 You don’t know if your patron Inquisitor is part of the Ordos Xenos (alien hunters), Ordo Malleus (daemon hunters), or Ordos Hereticus (literally everything else)? Nobody cares. Do your job, or you’ll be turned into a servitor. Doing a job well done means that you get the supreme satisfaction of knowing that your actions have pleased Him. And you get to live until your next mission. So you’ve got that going for you… which is nice. If that sounds like your cup of recaff, then light up a lho-stick and sign up for Brando’s “Root Out The Rot” game at the upcoming GameHoleCon. Be there or be a Tzzench-loving, Tau-faced, Hrud sniffin’, son of a Unsanctioned Psycher. 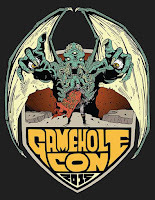 Gamehole Con registration opens September 5th, so pull out your percentile dice, load up your Heavy Stubber, and get ready to purge some cultist scum. For the Emperor!